A team of Seaver College physics students travels to a remote wilderness to further their research. Standing on the frozen ground in a desolate valley in Norway, seven student members of a Pepperdine research team witnessed the mysterious, ethereal aurora borealis rise up from the horizon behind the mountains and enlarge across the sky above them. Like the bottom of a waving curtain, the expanding light moved and shimmered. A reindeer sat in the snow nearby watching the excited students take it all in. Far from their sunny Malibu campus, the research team bundled up to face the frigid Norwegian climate. Rawie, her peers, and their professor, Gerard Fasel, stayed up until 5:30 that morning sharing their elation over witnessing, firsthand, the natural wonder they have studied for the past three years on Pepperdine’s Malibu campus. The group spent a week over winter break near the North Pole in Svalbard, Norway (population 2,000), an archipelago in the Arctic Ocean. The harsh, frigid environment is home to the Kjell Henricksen Observatory, an international facility that opened in 2008, and is used by scientists and researchers from multiple institutions worldwide. It is one of the only places in the world where the aurora can be seen in winter during all hours due to the 24-hour darkness. There, the Pepperdine team had direct access to highly sophisticated cameras and other equipment that examine and record the various aurora colors. The visit allowed the students to make huge strides in their research. “One thing that was especially significant about seeing the auroras in this context was that we understood more of what was happening with the bands of light because of the research we had done prior to the trip,” says junior physics major Ashley Rothballer. The students have been studying the interaction between the solar wind and the Earth’s magnetosphere in order to better understand space weather and its effects. At Pepperdine, Fasel and the students spend countless hours analyzing data dating back to the 1990s, collected via NASA satellite, and from ground instruments used by the Norway observatory and accessed online. Their collaboration with NASA has led to summer internships with the space agency and annual presentations at the American Geophysical Union (AGU) fall conference held in San Francisco, California, which attracts as many as 25,000 scientists. The Pepperdine team has earned positive feedback for its work. “The annual conference has been such a great experience because it’s thrown me out into the magnetospheric physics community and has taught me how to present research,” says senior physics and organizational communications major Sarah Bender, who has demonstrated the group's findings at the meeting for the past three years. In addition to Rawie, Rothballer, and Bender, the student researchers include Alexandra Angelo, Julia Flicker, and Mashaer Alyami. The team’s work is very specific and involves examining the consequences of the sun’s energy hitting the Earth and its effect on the variations of brightness, color, size, and movement of the aurora. The group watches for patterns, formulates explanations, and shares unusual activity. The data they analyze covers only the months of December and January each year, as that is when the aurora is most active and when the sky is darkest, revealing the phenomenon day and night. The research is labor intensive. 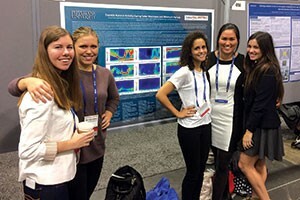 left to right: Julia Flicker, Megan Rawie, Mashaer Alyami, Sarah Bender, and Alexandra Angelo prepare for their presentation at the annual American Geophysical Union conference held last fall in San Francisco, California. The aurora occurs when solar wind sends millions of electrically charged particles toward the Earth’s magnetic field that are pushed up and down to the poles. The energy from these powerful impacts creates particles of light that appear as arcs, streaks, swirls, or waves. The aurora is not dangerous but it is a tool to understand space activity. Large solar flares have caused disruptions in television, radio, and satellite power in the past and may have an environmental effect as well. The aurora is not dangerous but its intensity and movement provide researchers with a tool to understand space activity. Fasel has been exploring this subject for two decades. In 1995 he relocated from Alaska to Norway to earn his PhD at the University of Oslo and to further his research. Over the years, Fasel has published multiple papers on the solar-terrestrial interactions. He has also presented decisive evidence demonstrating that poleward-moving auroral forms (PMAFs), parts of the aurora that seem to break off and head toward the pole, rebrighten and may be a consequence of multiple reconnection. Fasel’s students have continued his research, analyzing data from clear days when PMAF’s can be seen. Another instrument the team has regular use of is the meridian-scanning photometer, which scans a narrow slice of the sky, changing view every four seconds. Having access to the Norway observatory allowed the students to utilize the all-sky camera, as well as 25 other high-tech optical instruments, and obtain complete views of the aurora. “We were able to see the aurora almost every night. Whenever we were inside, we would have several all-sky cams up on our computers monitoring the aurora activity. And we made sure to keep each other updated whenever we thought there might be activity,” Rothballer recalls. The experience of living in a polar environment and seeing the aurora brought the close group even closer. Just getting to the observatory was an experience in itself. Located 10 miles from Longyearbyen, the nearest town, in an isolated glacial region with one of the largest concentrations of polar bears in the world, the facility is accessible only by military vehicle during the winter months. Wilderness training was required in order for students to understand how to protect themselves from polar bears, and from the treacherous, minus 20-degree cold. The constant darkness meant a lot of time spent indoors together researching, analyzing, discussing, cooking, watching a Christmas movie marathon, and enjoying a traditional Norwegian Christmas dinner. 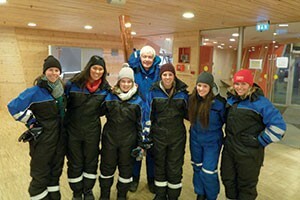 In one outdoor excursion, the group experienced the beauty of the polar region through dogsledding. The Pepperdine team also benefited from meeting and sharing information with local scientists doing related work. The trip was made possible by the support of the University President’s Office. “This endeavor is one example of the many significant scientific research projects taking place on campus that are providing our students with valuable hands-on experiences they would not have elsewhere, and that are striving to make a positive difference in all of our lives,” President Benton says. The students credit Fasel with instructing them in how to explore and discover on their own, and for giving them opportunities that are primarily reserved for graduate students at other universities. Most of the students sign on to the team at the end of their freshman year or at the beginning of their sophomore year and remain with it until they graduate. The team meets at the beginning of each semester to review status of the project, discuss their theories, and then see if the data support their ideas. Each member works independently on investigating the theory, sharing findings with one another, and receiving support from Fasel when needed. Since their return, the researchers have been busy studying the new data they brought back with them from Norway in order to better understand magnetic reconnection. For all of the students, the lessons learned from the aurora project will remain with them long after graduation.